Each student will need to bring a laptop to program with. 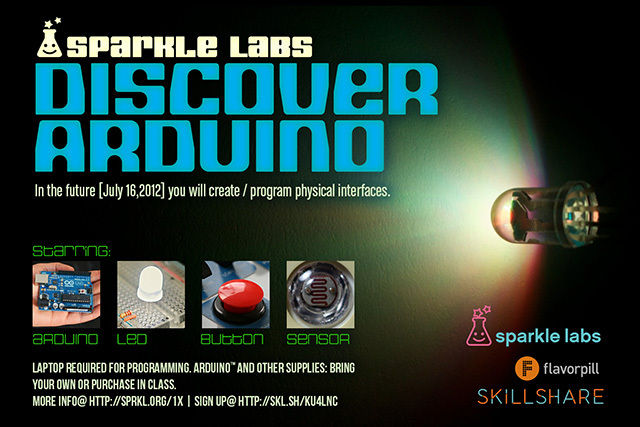 You should install the Arduino software before class. Other equipment may be purchased in class or bring your own. The class will take place in the Flavorpill office at 594 Broadway Ave. Suite 1212. I don’t have an arduino or any of the components. I will be attending the class and will bring my laptop. How much $$ should I bring to buy the arduino and components? Thanks! Other parts are $1 or under and I will have some second hand parts to lend or sell. I am creating these to go along with the Discover Electronics Kits but for the first part you only need an Arduino, a breadboard, and a few additional parts. Please try it out and tell me how it goes. Is there any way to sign up without having a facebook account? We don’t use facebook. Also, can we come to the class early to purchase the components and set up our laptop? You would have to ask Skillshare about that. You could pay me directly if you prefer. Coming to class a bit early is a good idea.